More than the Shia-Sunni sectarian differences, these days you hear about Barelvi-Deobandi schism. 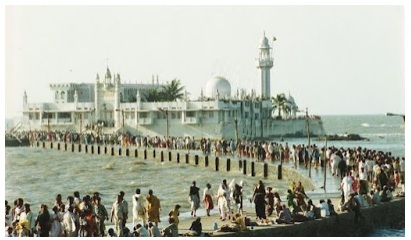 The Sunnis, who form a majority of population among Indian Muslims, are seen as 'Either Deobandi or Barelvi'. There are many non-Muslims who claim to have studied Deobandi and Barelvi sects, and have emerged as experts lately. The truth is that the nuances and the nature of beliefs is such that they can't understand them. It is not easy to comprehend the complexities, similarities and differences, especially, for an outsider. Damn confusing, I must say. Worse, it is the sweeping generalisation, and nomenclature that has compounded the problem. *Those who are not Deobandis, are all considered Barelvis. *And those who are not Barelvis, are all termed Deobandis. But the reality is not as simple. There is a huge Muslim population that may not fit in this caterogization, which is often thrust on them even though these terms are of recent origin, in the long history of Islam. This post has been written after witnessing the huge amount of energy spent on social media by followers of these sects in recent times. There is a strange passion and people are ready to go to any limits, severing relationships over perceived differences. Initially it may be difficult reading but do read till the end, especially from point 7-10, and the concluding text. 1. Categorising someone is so simple. Let me first start with those Muslims who don't subscribe to Deobandi school of thought. By default this population is termed Barelvi but many of them may not have even heard of Ala Hazrat [Ahmad Raza Khan Barelvi], let alone visited his shrine or have any special regard for him. 2. Similarly, many non-Deobandis feel that anyone who is against visiting Dargahs, is a Deobandi [or Wahabi]. This is also untrue. Deobandi beliefs are seen more in sync with the Salafis who rule the Saudi Arabia. However, it is the Ahl-e-Hadith sect in India, which has spread more in recent decades, and it represents the Salafis here. As rituals vary from region to region and even family to family, it ironically comes to the point that what one has seen in his household, is 'true' for the person. 3. Your parents didn't follow a ritual, so you believe that the other person who performs it, is outside the pale of Islam. On social media, there are people who can readily call a fellow Muslim, 'non-believer' just because he wears an amulet. 4. Many from both the sides may even be on the same page when it comes to women--issues like women going to a grave yard, but would still brand the other group for the 'undesirable practice'. In fact, this is endless. 5. From participating in a 'Milad' to going to a 'Urs', any practice may be condemned. But if you belong to a sect that opposes it and yet it is your family tradition, you justify it. 6. Similarly, the counter-charge would be that the particular sect is trying to lessen the love for Prophet. With the Saud family's hold and the manner in which heritage has been destroyed in Arab, it makes for a strong argument. The Khanqahis [associated with Dargahs] are also considered as Barelvis by default. 7. Though there are Sufis whose love for Ali reaches the stage where they are termed close to Shia doctrine, there also Pirs and Sufis who are now close to Deobandi beliefs. Of later, we have been hearing that Barelvis are more liberal or accommodating. 8. But, when it comes to the sole Muslim public event--Muharram, both Deobandis and Barelvis are against it. The mourning procession on the day of Yaum-e-Ashurah is generally believed to be taken out by the Shias. While Shias take 'alam' and perform 'maatam', it is only Sunnis or some Hindus who take out 'Tazias' or organise the 'akhadas'. Shias don't take out Tazias. Now, all these Sunni Muslims are termed Barelvis. 9. But Imam Ahmad Raza Khan's stand was quite harsh on these practices. He opposed them, issued fatwas and his followers are also against these Muharram observances. So who are these people who are on streets during Ashura? Of course, Muslims--the Sunni Muslims, in fact, the ordinary Muslims, who mourn the killing of their Prophet's grandson and his family at Karbala. Unfortunately, it's so easy to compartmentalise and categorise! Of course, most of these people are poor [it is the poor among Hindus too who mostly participate in Dussehra, Dahi Handi or similar events]. 10. The Barelvis dislike them. The Deobandi too, who is more urbane, decides that these people are 'non-believers' or 'corrupt'. The 'elite' [moneyed] declares that these practices are not in sync with his sophisticated lifestyle and terms them as 'jaahil' [ignorant]. Even more recent phenomenon is that a section of 'elite Shia' are also seen avoiding self-flagellation or attending the mourning processions where blood is shed. Is it like elite Hindus these days who often claim that they don't play Holi like the louts! Despite Islamic injunctions to avoid judging others, it has become routine to call the 'other', 'unbeliever' just because his/her sect is different. And there lies the real tragedy. Somewhere in between, may come the Tablighi Jamat enthusiast. If he finds you not inclined to go with them, they might look down upon you as someone of 'lesser faith'. This is all internecine Sunni differences. We haven't touched Shias as yet. The reason is that it is Barelvi-Deobandi dispute which is tearing apart the community. The sectarian bug is much more severe than any religious divide. People openly write on invitation cards that a person of other sect [in case he might have got the card by mistake because the sender wasn't aware of his sect], must not attend the wedding ceremony. In many parts of the country, the grave yards are now separate for those belonging to these two different sects. In real life and on social media [after debates], people shun old friends just because they discover that the other person performs a particular ritual or has a different take on certain things. Again, it is the same obsession to turn everyone like yourself. To prove your point, you may bring your citations or examples, the other person also has his own. What exactly is this sort of obsession and silly arguments over traditions and practices? Not just Quran and Hadith, but innumerable other examples are given and this adds to more bitterness--the idea and the effort is just to convert the other person to your exact position on every ritual. Even more interesting is the lack of knowlege. As few read Quran along with the translation, and even few have gone through the Hadis [Hadith], the arguments are for the sake of argument and the aim is to somehow prove the other person wrong, as only your sect should be on right path. In order to win argument, they ultimately go to the cleric of their own sect or search on internet--from websites favourable to your sect to videos on YouTube. Why all this effort? Ego trip, what else? Tell me with your hand on your heart. In the era of social media boom, when you find forwarded posts by friends and relatives on WhatsApp, Facebook and Twitter, on every festival and observance--asking you to either shun or embrace some ritual, in order to fall in line, how do you cope? How much you can ignore. It is damn irritating. Imagine, there are cities where people fear to go to a new mosque where they haven't gone before, because the way they offer prayer may incur wrath of the sect that controls the mosque. In this backdrop, I am asking, is it possible to be 'Simply Muslim'? I ask this question myself, often. Still there are the vast majority of Muslims--simple Muslims, who are still not afflicted with this sectarian bug. However, the pace at which the sectarianism is growing, is scary. 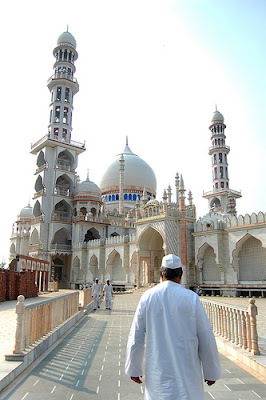 The biggest mosque in India is located in Bhopal. Just because the mosque is not in a metropolitan city, this fact is not known as much. Tajul Masajid* is one of the biggest mosques in the world and is an architectural marvel. It is much bigger than Delhi's Jama Masjid, which is generally termed as India's biggest mosque. The name Tajul Masajid means 'Crown among Mosques' [pronunication: Masaajid, plural of masjid i.e. mosques]. The construction of Tajul Masajid began in 19th century, when Bhopal was a princely state. 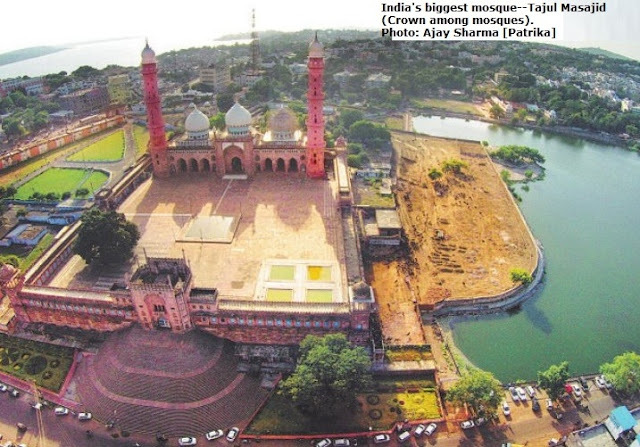 Nawab Shahjehan Begam who ruled the Bhopal state, wanted to build a grand mosque. The construction began but it couldn't continue for long and the mosque remained incomplete. It was in the twentieth century, a few decades after independence that Tajul Masajid was completed. Maulana Imran Khan Nadvi had taken up the task on himself to complete the mosque. It was the decade of 70s that the mosque finally got completed. Apart from the main structure and the vast courtyard, its minarets are also much thicker than Jama Masjid, Delhi or other major mosques. The huge area on either sides is also part of the mosque. The pond is also part of the mosque land as it was built for the purpose of 'wazu' [ablutions] for people who come to offer prayers [Namaz]. There are hundreds of students who live in rooms on the campus and study in the madarsa here. The mosque also has a separate space for women to offer prayers. When descendants of the royal family came to Bhopal, they prayed in the part of the mosque. The Tablighi Jamat's annual Ijtima was held here in the past. For over half-a-century, the Alami Tablighi Ijtima [grand annual congregation] was held at Tajul Masajid. A market also used to develop in the area during Ijtima. However, a few years ago the Ijtima venue was shifted to Eintkhedi, outside Bhopal. Tajul Masajid is unique in many ways. Close to the mosque, on the other side of road is Dhai Seedhi Masjid--Two and half staircase mosque, which is said to be among the smallest mosques in the world. It was initially built on a 'burj', which was part of Bhopal's Fatehgarh fort. 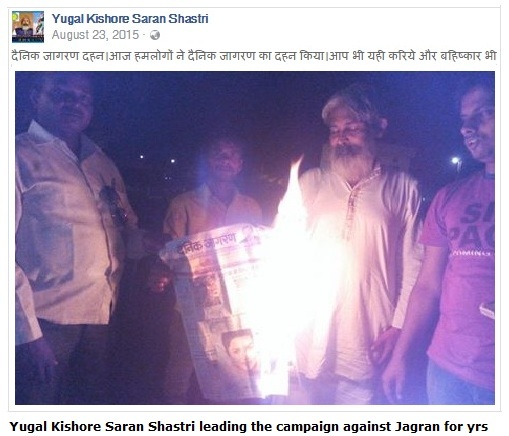 The photographs on the left shows a leading Hindu religious guru, Yugal Kishore Saran Shastri, burning a copy of Dainik Jagran. Shastri who is based in Ayodhya, has been running a campaign against Dainik Jagran, which he calls a divisive and communal newspaper because of its allegedly one sided and biased reports. Shastri, a priest, who is also a peace activist, has been running a campaign, urging people to boycott this Hindi newspaper and subscribe any other paper. On Saturday, once again calls to boycott Jagran surfaced. On social media, hundreds were targeting the paper in the wake of the false reporting during the Bijnore violence. Muslim girl was eve-teased and later her family members were gunned down but the paper gave a wrong and completely fabricated turn. Upset, social media users began trending 'boycott_Jagran' and 'BanJagran' on Facebook and Twitter. But will it work? Why Dainik Jagran is always at the forefront when it comes to inflammatory reporting that divides the society on communal lines? Throughout the decade of eighties, Jagran led the Hindi press in Uttar Pradesh, when it came to poisoning the minds of the readers. During the Rath Yatras, it was known for its clear extreme right-wing leanings. It became notorious for exaggerating and misreporting. As it was the paper with largest circulation, [it still is, though Dainik Bhaskar is close now], it managed to influence the readers and even changed perceptions. The communalism in cities and towns of UP during eighties and nineties was a result of this 'propaganda journalism'. Even today, Jagran remains a newspaper where pro-Hindutva stories are given preference. Almost everything is presented with the view to give impetus to the movement, and hide or misreport facts, if they have the potential to affect BJP or Hindutva brigade. How to tackle the biased newspaper(s)? Newspaper is a product. When you go to restaurant and get bad food, don't you complain! Similarly, find phone number which is generally on last page and insist on talking to editor or owner. Tell them why you are going to stop the paper's subscription. Also, if the reports are false and can create communal situation, FIR can be registered. Even if police doesn't register case, a complaint works. From Press Council to Minorities' Panel and Human Rights Commission, there are umpteen forums. There can be complaints. If there is a report that fans communal hatred and has potential to divide society, take delegations and submit memorandums against newspaper to Chief Minister, Ministers, DGPs, DMs, other officials. Also, lawyers can do a lot, private complaint can be filed in the court, with owner and editor as party. 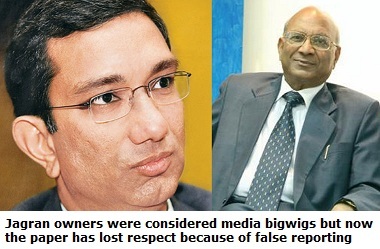 The day, owners, start getting dragged to courts, no one will dare to write insensitive and false reports. Also, when hawker or salesperson come, do tell them clearly why you won't subscribe the newspaper. There are many more ways. Peaceful, democratic, legal means. These are basic things which are required. Common people including illiterates and villagers take all these steps when it comes to injustice. However, if educated and 'persecuted' Muslims can't even do this, continue to indulge in drawing room or social media talk, remain careless about rights and duties, and expect that things will change their own, they are living in a fool's paradise. Can keep crying for ever. Entire Chhattisgarh was in a state of mourning as Daud Khan passed away. The 93-year-old was known for his discourses on Ramayan and life of Lord Rama [from Ramcharit Manas] that were attended by thousands. 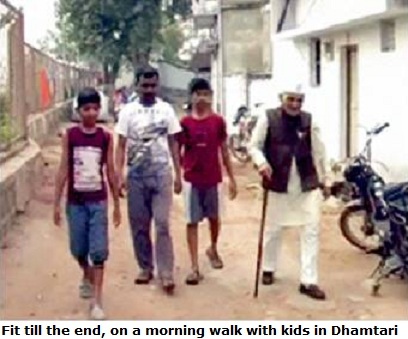 A household name in Chhattisgarh, Daud Khan had been reciting and delivering the disourses, since 1947. For nearly 70 years, he gave the 'Manas Pravachans' in more than 1,000 cities, town and villages across different states. 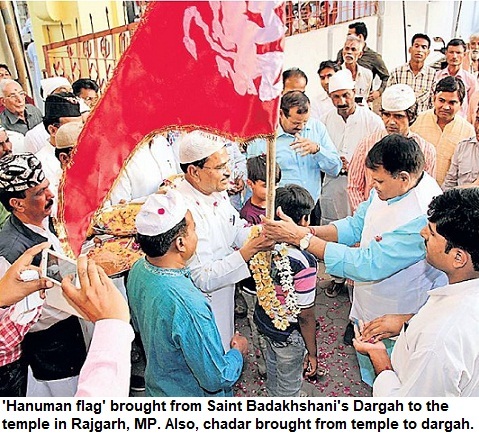 Lovingly termed 'Baba' or 'Khan Sahab', Daud Khan hailed from Dhamtari, now a separate district, which was once part of the Greater Raipur district. His first lecture was in Allahabad University in 1947. From 1949 to 1960, he travelled from village to village, reciting the 'Ram Katha', delivering discourses about the life of Lord Rama. Subsequently, he developed his own style--explaining Ramcharit Manas 'prasangs'. People would get entranced and said that they felt contentment and happiness after listening to him. Always agile and fit, despite his age--from UP to Maharashtra, Madhya Pradesh to Odisha, he would go to faraway places. Not just Tulsi, he was inspired with Kabir too. President VV Giri had felicitated him in 1970. Later on, he got many other state-level and national awards. As per his wishes, he was buried in the grave-yard at Kurud in Dhamatri. Top politicians, dignitaries expressed their shock at his death. However, it was the outpouring of grief by the public, the ordinary people in Chhattisgarh, which showed the love Chhattisgarhis had for him. Newspapers published entire pages, devoted to his life. Daud Khan Ramayani was a teacher. Apart from religious discourses, he was active in social work. Though he hardly had any extra money, he devoted himself to education of poor children. He financed many children's education up to the graduation and engineering, especially, those from the under-privileged background. Such was the nonagenarian's popularity and his dedication that Ramayani became a part of his name. He had command over many languages including Sanskrit, Urdu, Hindi and Chhattisgarhi. Apart from Hinduism and Islam, he had studied other religious texts, especially, Guru Granth Sahib, too. His daughter Badrunnisa said that when at home, he would recite the Katha to family, neighbours and friends, for 45 minutes every day. Minister Ajay Chandrakar who was his student, said that his teacher Daud Khan had a lasting influence on his life. Chief minister Raman Singh expressed profound grief at the demise of the famous preacher. 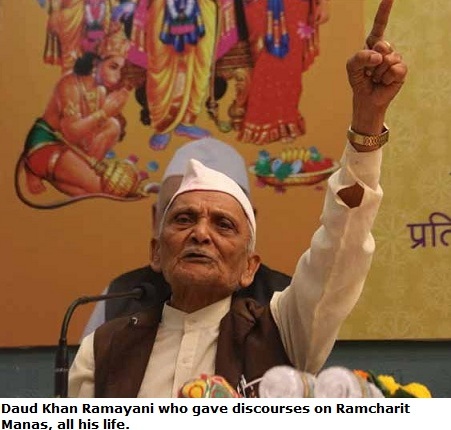 He said that Daud Khan was to hold a Ram Katha pravachan in Raj Bhawan within a few days. Photos are courtesy Dainik Bhaskar. 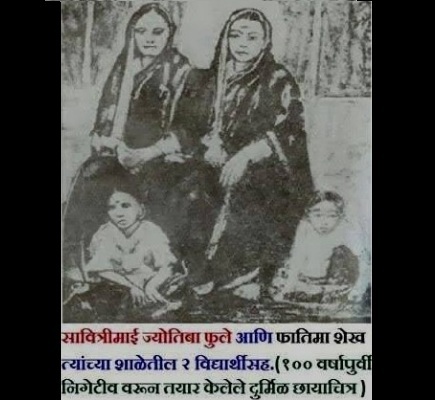 Savitri Phule and Fatima Sheikh had set up the first school for girls in India. That was in the year 1848. 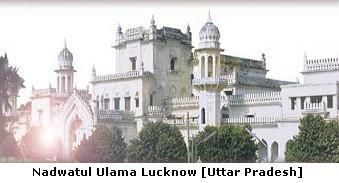 The school was opened in the house of Fatima and was also run at her brother Usmain Sheikh, for a period. In an era when the orthodox called it a 'sin' and were against education to women, especially, untouchables-backwards, this landmark step was taken despite fierce opposition and threat to lives. Savitri Phule would carry an extra dress while going to the school, as cow dung was thrown on her at the instance of upper castes who were opposed the education to untoucahables, the backwards castes and women. They threw stones at her, but nothing could shake her steely resolve and the will to educate the girls belonging to dalit, backward and other oppressed castes. When casteism was rampant and the upper castes in Pune were opposed to Phules for the their socio-educational efforts, Fatima Sheikh extended full support to Savitribai in the endeavour. Such was the opposition that there was even attack on the lives, killers were sent at night to murder Phule. The first school was set up in 1848. Fatima Sheikh taught here. Saguna Bai, another leading light of the movement, also taught here. This school was founded in Pune [then Poona], which was once the seat of Peshwas. The British had taken over the Maratha empire in 1818 and were now firmly in saddely. Savitri Phule's husband Jotirao Phule [also spelt, Jyoti Rao Phule] were the leading reformers of the country--for their role in education, in widow remarriage, for opening educational institutions and homes for the destitute. Jotirao mentions how English education helped expand his vision in his student years. He also writes about the positive influence of his Muslim friends. Phule was one of the first crusaders against caste system and a voice of rationalism in the era. Mahatma Phule hoped that just like people from the White ruling class had spoken for the Blacks in USA, in India too there would be a class among Upper Castes who would fight against caste discrimination and oppression. He had established the 'satyashodhak samaj'. His book, 'Goolamgiri' is among the most famous and enlightening texts. In fact, such is the contribution of these luminaries that hardly any other figure in that era or later generation comes close to their stature. 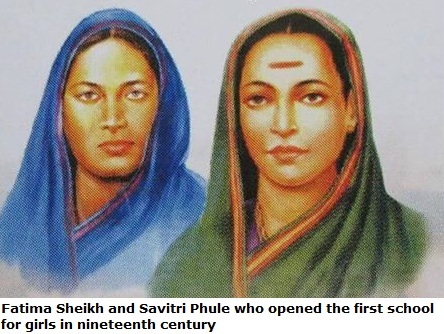 Salute to Savitri Phule, Fatima Sheikh--the pioneering educationists and great teachers who rebelled against society and lit the lamp of education in India. We must remember their effort, sacrifices and should get inspired to move ahead.